How to convert PDF to flash flip book for free? Is there a way to convert PDF to flash flip book for free? And could you show me how to do this in detail? Yes, you can use the free version of A-PDF Flip Book Maker. This free flip book maker does not only allow you to convert PDF to flash flip book for free, but also provide you with a lot of amazing features to make your publication more attractive. It's free, easy and fast. You can publish the book in only 3 steps. Launch the flip book maker, and click "Create New" to create a new project, in the next screen, import a PDF file and select different options for the free flip book publication. Now, you will see the main Design interface, you can select a template for the free book, and design your flash flipbook with various custom settings: logo, language, background, music, assistance, plug-in, etc. Now you will like to publish the free flash flip book. Click "Publish" button or the Arrow button next to it, and you can publish the book in different format: HTML for online reading, ZIP for email, EXE for standalone executing on PC, App for reading on Mac, To FTP Server, Screen Saver, WordPress plug-in, Joomla module or Drupal module. 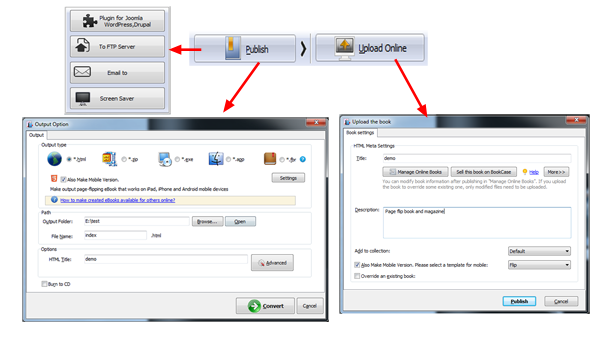 Moreover, you can publish the book online directly using the Upload Online Service.